The health of this instrument could be damaged by handling and playing. An alarming statement but true never the less. Acid rain is now quite a familiar term and most people understand the damage it causes to our food sources and buildings. 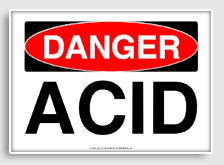 But other kinds of acid affect all of us in daily life and yet we accept them with a shrug or are completely unaware of them. Do you know that acid is slowly but relentlessly attacking those beautiful and costly instruments each time they are handled and played?. Players exude acid in sweat, so fingerprints immediately begin to etch their signature into the metal; breath and spittle encourage further acid attack. Additionally, there is abrasive wear from contact with clothing. Most brass instruments are burnished to a high shine and then clear-lacquered by their manufacturers. Although modern lacquers are quite tough they eventually break down under constant handling and develop micro-fine cracks. It is through these cracks that the acid of human contact is drawn. The discolouration of tarnish and even verdigris is then free to spread under the lacquer. In professional fine-art conservation, the use of lacquers to protect historic metals, such as arms and armour in national collections, has long been discredited, as have oils and greases. Restorers and conservators know that any surface treatment that attract and hold dust can be hazardous to long-term preservation. When brass instruments become visually unattractive from intensive use, some manufacturers will accept them for refurbishment. This is usually an expensive process involving the complete dismantlement of the instrument, followed by immersion in a lacquer-stripping acid prior to any surface repairs, re-polishing and re-lacquering. As a supplier of fine art restoration products, they are eminently suitable for cleaning and caring for these beautiful musical instruments. The Vulpex liquid soap, which can be diluted in water or white spirit (for non-aqueous cleaning), cleans and de-greases all metals with 100% efficiency, leaving nothing potentially harmful behind. Where there is tarnish or light corrosion, our Pre-Lim paste gently burnishes to a bright, scratch-free shine, ready for permanent protection by Renaissance wax. Before waxing any metal it is important to ensure that the surface is clean so that tarnish does not spread beneath the wax. Renaissance wax is a truly universal in application and is used to protect and visually enhance every type of surface, from paper to stone, both inside the building and outside to guard against weathering. The wax protects a huge range of famous bronze statues and monuments in city streets and parks in the UK and other countries. While museum exhibits are rarely handled, brass band instruments - by the very nature of their design and purpose - are far more vulnerable to surface degradation. For the relatively modest cost of our cleaners and wax polish, owners can greatly extend the service life of their instruments - and ensure the utmost visual beauty of the metal. To help keep the instruments in good condition, we will publish a number of useful guides about the care and cleaning of musical instruments.